Black and Blue: The Unofficial Lincoln Stars Blog: Congrats to David Gerths! Lost in all the Lincoln Stars gloom and doom this past weekend, Stars forward David Gerths helped the Team USA Junior Select Team win the gold medal at the World Junior A Challenge in P.E.I. Canada. This was the second straight year that David has helped Team USA win the gold medal. 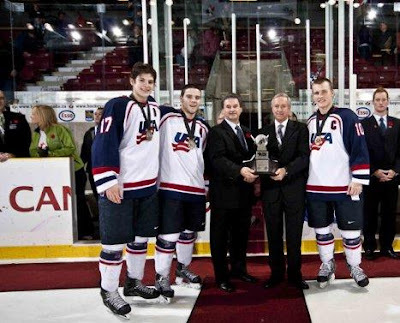 This past Sunday afternoon, Team USA defeated Canada West by a score of 2-1 to clinch the championship. David (who was captain of the team) assisted on the first Team USA goal in that game. Congrats to David on winning his second gold medal! It's great to see Gerths succeed with the USJS team. But, I'm sure I'm not the only one eager to see him back in a Lincoln uniform. We can definitely use him right now. Great to hear of David's positive impact at World Juniors through leadership as Captain & through hard play on the ice. I don't know players personally, but learn about them through interviews & media. It is easy to see David leads by example, not talk - he speaks volumes when on the ice and have never seen him give less than 110 percent. Well done David - looking forward to your return! Hope to see strong support for our Stars in the games ahead. Let's prove that calling ourselves the best fans in the USHL is not just rhetoric, but fact. And show these young men why Lincoln, NE is the best place to play junior hockey. Go Stars!! Congrats Dave,great job by you and the rest of the team at the Junior A Challenge.You represent the Lincoln Stars and Notre Dame very well. This speaks volumes of the type of character player Gerths is. We are lucky to have him on the team. Congrats Gerths!